Eco Supply Center is a green building furniture manufacturer for commercial and residential interiors. Headquartered in Richmond, VA, it is family-owned and was founded in 2005. Their work has been featured in Inspired House, Dwell, Elle Décor, and Metropolitan Home. 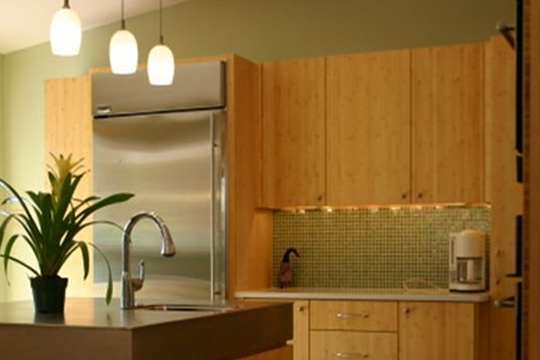 Using 100% post-consumer and reclaimed agricultural fiber such as bamboo and sorghum, products range from countertops, flooring, paint, furniture, and more. Headed by wooddworker Anthony Brozna, their Ecoline collection incorporates Brozna’s quality workmanship with environmentally-responsible materials like storm-salvaged hardwoods, eco fabrics, and non-toxic finishes. Their website features Eco Supply Center’s various products, services, and Ecoline collection.